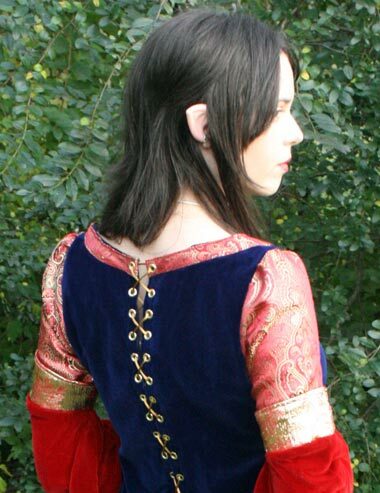 When I first decided to make this particular blue and red Arwen dress, I found that I had to use the best materials available. I found the blue velvet, for the main part of the Arwen dress, at Joann’s for $24.99 a yard. Luckily though, I had a 40% off coupon which you can find pretty easily online. 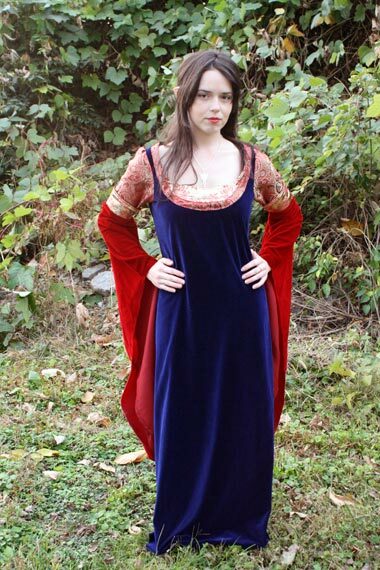 The red velvet for the sleeves of the Arwen dress was a little less expensive. It was about $10.00 a yard for the slightly lower quality velvet. 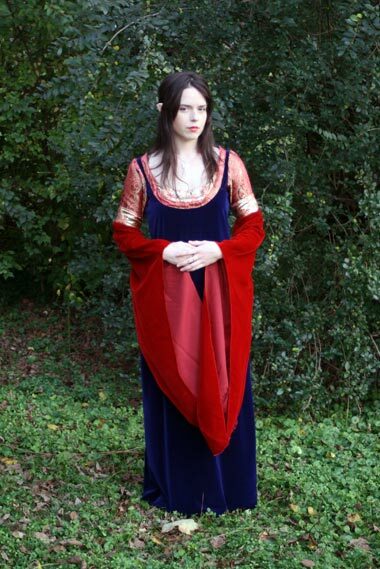 The shinier red parts of the Arwen dress are made out of two types of polyester fabric. They can both be found at Joann’s in the Sari fabric section. Since I could not find lace to go around the center part of the sleeve, I used the same upper bust-line fabric. I think it works just as well anyways!! The pattern for the dress came from a vintage simplicity pattern that I modified to fit Arwen’s many dresses. 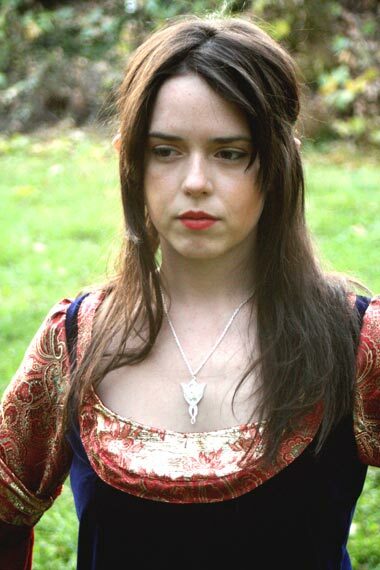 As you can see in this first picture, I am wearing the Arwen Evenstar necklace. The Arwen Evenstar necklace is available at aradanicostumes.com for $10.00 plus shipping. This photo is also a nice close-up of the detailing around the bust line. In this next photo you can see the small elf ears I am wearing. The elf ears are also available at aradanicostumes.com for $15.00 plus shipping. The back detailing on this dress is what Mike and I decided would make the piece more period. I was going to put a zipper in, but we thought the large eyelets would be a nice touch. You can also clearly see the gold and red detailing of the arms and upper back. Here are more pictures of the Arwen dress. I hope you like it!! Arwen was the youngest child of Elrond and Celebrían. Her elder brothers were the twins Elladan and Elrohir. Her name Ar-wen means ‘noble maiden’. She bore the sobriquet “Evenstar” (or Evening Star), as the most beautiful of the last generation of High Elves in Middle-earth. As told in “The Tale of Aragorn and Arwen”, Aragorn in his twentieth year met Arwen for the first time in Rivendell, where he lived under Elrond’s protection. Arwen, then over 2700 years old, had recently returned to her father’s home after living for a while with her grandmother Lady Galadriel in Lórien. Aragorn fell in love with Arwen at first sight. Some thirty years later, the two were reunited in Lórien. Arwen reciprocated Aragorn’s love, and on the mound of Cerin Amroth they committed themselves to marry each other. Arwen first appears in the text of The Lord of the Rings in Rivendell shortly after Frodo Baggins awoke in the House of Elrond. She sat beside her father at the celebratory feast. When the Fellowship of the Ring came to Lothlórien, Aragorn remembered their earlier meeting and paused in reverence on Cerin Amroth.